Hello! Today I have a card with a water colored background. 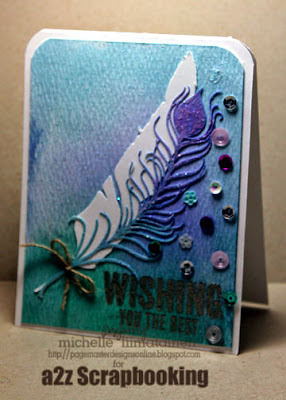 There is a new challenge on the a2z Scrapbooking blog and this month is all about Watercolor. Have you ever had a card you loved. I mean really, really loved and then botched the Title? Yep, that is this card. I love how the background came out on this one. Mind you, I made at least 4 and not one came out nearly as pretty as this one. Most were a total disaster with blue and dark green every where...I just couldn't get the purple to show. See, I started out by putting my Distress inks on a large acrylic block. The Tumbled Glass and The shaded Lilac were so over powered by the Evergreen Bough, but I love the combination. 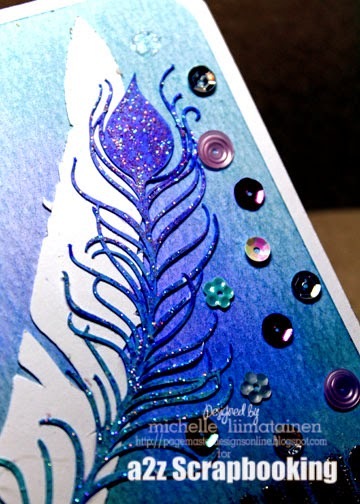 So I resorted to using my re-inkers for the Tumbled Glass and Shaded Lilac. The colors were most definitely bolder! Too bold in fact. I had to use less re-inker and more water for the softness I was going for. Enter the FOURTH try and it finally gave me what I wanted. YAY!!! Let's just forget about the title and oooh and ahhhhh over that background and peacock feather shall we? A little bit of Stardust Stickles on the feather and some sequins and I have forgotten all bout the sentiment. Please stop by a2z Scrapbooking to see what the other design team members have done. You won't be disappointed. It's CYBER MONDAY too and I have a coupon code for you for Today...Use CYBER20 for 20% off your order of $25. Click HERE to go to the store. If you don't get to shop today you can use the code MICHELLE15 at anytime and get 15% off your order of $25 or more.